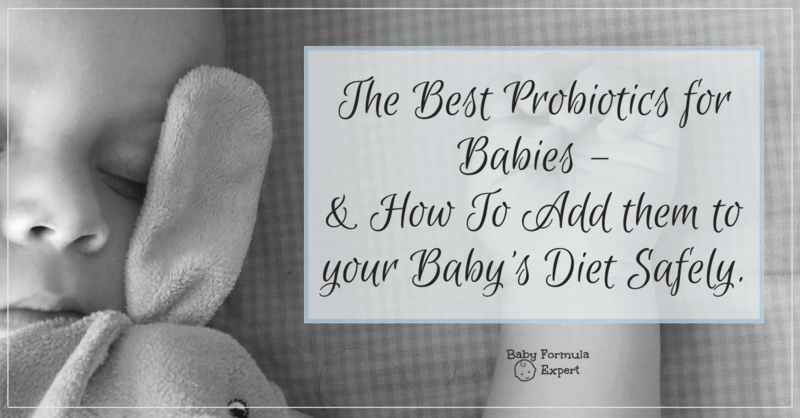 This article provides my detailed instructions about how I recommend introducing probiotics into your baby’s diet. I’ll try to keep it as brief and action-oriented as possible. If you haven’t read the first article in this series that gives you all the background you need to know about your baby’s microbiome (all those good bugs in her little intestines), I highly recommend you read that first. Before I begin, I have to repeat my disclaimer: I am not your pediatrician! ALWAYS check with your doctor before adding any supplement to your infant’s diet. However, you can easily share this article with your doctor before trying it out for yourself. And, let’s be honest, most docs are happy to let you experiment away in your own home. If you both a prebiotic and a probiotic in your baby’s diet, I recommend choosing a prebiotic baby formula and then manually adding in a probiotic supplement. I like this combination for a few reasons. First, probiotic formulas are only available in powdered form so you have a little less flexibility at the store. Secondly, there is no prebiotic-only supplement currently marketed for infants that has been sufficiently tested for safety (that I know of!) There are plenty probiotic supplements that meet my safety criteria. So, in order to get the benefits of both, choose a formula with prebiotics and add your own probiotic. For a list of the name-brand formulas that provide prebiotics, check out the previous article. Remember, there are other more important things to look for in your baby formula, like hydrolyzed protein (if you need it), and lactose. If the decision comes down to prebiotic or hydrolyzed protein? Choose the hydrolyzed protein, add your own probiotic supplement, and don’t worry about the prebiotic. Your little warrior will still grow just fine! What probiotic should I add, and how do I give it to my baby? 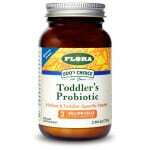 There are several different kinds of probiotics on the market that are designed for infants. The main brands that I am aware of are described in the table below. I give my opinion on each in the following paragraphs. I do recommend that you choose a brand marketed for infants because these are more likely to be the appropriate types of good bugs and give appropriate proper recommended dosage for babies. There are LOTS of other brands out there – if you find one that’s not on this list, ask your doctor what he/she thinks. This supplement is from a nutrition company that I trust. It only contains a single type of bacteria, but this is one of the main good bacteria that live in breastfed babies’ intestines. It comes in a powder form. The dosages on the label (above) are for adults and is also what is recommended by the company’s nutritionists for infants. I think this is too large of a dose for babies and think 1/2 a dose is a good amount. This company totally changed the probiotic over the last few years (for the better!). Now they use a very safe strain that has been well studied for safety and is even included in some formulas. It has a great storage life at room temperature too. Bigger deal: This probiotic also contains a PREbiotic (fructooligosaccharides). They don’t tell you how much it contains, but it may be a great solution if you have a simple formula you love, but you want to add both a pre- and probiotic. I wrote a bit about this strain of bacteria above. It has been shown to be safe for babies and may even help reduce the severity of colicky babies. It comes as a handy liquid with a dropper (similar to lots of vitamin D drops). You give baby 5 drops per day. Gerber and BioGaia seem strikingly similar, don’t they…. Get whichever is most convenient, and you can feel OK switching back and forth between the brands if you need to. This supplement is a powder that comes with a pre-measured scoop. It is different from the above options because it actually provides several (5 to be exact) different types of bacteria at once. All 5 types are found in large amounts in breastfed babies’ intestines, and are considered safe as probiotics for infants. I was introduced to this supplement from a well-known acupuncturist that I respect, Chris Kresser. I like it because it provides 10 (wow!) different types of bacteria, all of which are OK for babies. Plus, the price is great! The only downside is the powder is extremely concentrated so ¼ teaspoon is a full day’s dose for baby. This makes it hard to “ramp up” to a full dose as it can be difficult to measure out one quarter of ¼ teaspoon. So if your baby is very sensitive, or a newborn freshling I recommend starting slowly and working up to this brand and dosage. This is a great probiotic and a brand known by most pediatricians. It is a blend of 2 “powerhouse” (well studied) infant strains. If your little one needs a probiotic and you want a little more than the single strain/lower dosage in Gerber Soothe, but aren’t ready for the larger mix of strains in some of the other blends, this is a perfect middle-ground choice. Also, Culturelle has a few varieties – some come with vitamin D, and some come with chamomile for calming. This is another good company and this multi-strain blend is a great option for a baby that can tolerate more than one strain. I consider it similar to the Klaire labs in that is has many strains. I like the 3 billion dosage better for babies than the 10 billion in Klaire labs but both of these are easily adjustable at home. Another big win for this probiotic – it is available in lots of health food stores (including Sprouts, Sunflower, Whole Foods and more), so you can purchase it right out of a refrigerator and know that it has been properly stored. Tell your doctor what your plan is before you start. Ramp up the dosage slowly. Spread the dose out throughout the day. Add one supplement at a time. In general, I would prefer to see a nice mix of several known good bacteria. This will help baby’s intestines to look more like a breastfed baby’s. However, every baby is different. Some are very sensitize to small dosages, and others don’t seem to notice at all. So, how you ramp up to a blend of many probiotics, and which you start first should look different for every baby. I am giving four categories of infants below. Pick which fits you best and then follow those instructions. I suggest starting with Gerber Soothe drops. It may help with the colic, and it only has 1 strain of bacteria to not overwhelm your little one! If your baby is under 3 months old, work your way up to the full dose (5 drops per day) over the course of 2 weeks. If your baby is over 3 months old, work your way up to the full dose (5 drops per day) over the course of 1 week. Monitor for signs of intolerance or intestinal distress each day. Be sure you are splitting up the supplement throughout the day, not all in one bottle. This will more closely resemble breastfeeding and provide a nice constant stream of probiotics to the intestine. Once you have made it to the full dose and haven’t experienced any negative side effects, stay at this dosage for about 10 days to 2 weeks. Then add in the NutriKey bifido powder or Culturelle in the following manner. If your baby is under 3 months old, work your way up to the full dose (three ¼ teaspoon servings per day) over the course of 2 weeks. If your baby is over 3 months old, work your way up to the full dose (three ¼ teaspoon servings per day) over the course of 1 week. Be sure you are splitting up the supplement throughout the day, not all in one bottle. This will more closely resemble breastfeeding and provide a nice constant stream of probiotics to the intestine. You can provide both supplements at once. Once you are up to the full dose on this second supplement, stay here. This will provide baby with 1 good strain of Lactobacillus and Bifidobacterium. Consistency is key and providing these supplements every day will provide great support for digestion and is more likely to result in stable changes in the microbiome. I have generated a dosing worksheet to help introducing a probiotic. Put it on your fridge and monitor your little one’s progress every day. I have generated a dosing worksheet to help introducing a probiotic. Put it on your fridge and monitor your little one’s progress every day. I still suggest starting with Gerber Soothe drops. It may help with the colic, and it only has 1 strain of bacteria to not overwhelm your little one! Once you have made it to the full dose and haven’t experienced any negative side effects, stay at this dosage for about 10 days to 2 weeks. 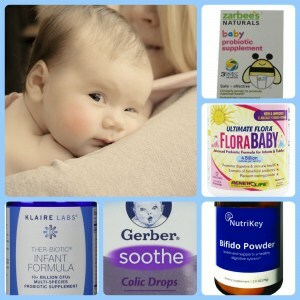 Then add in the RenewLife– FloraBaby or Udo’s Choice in the following manner. If your baby is under 3 months old, work your way up to the full dose over the course of 2 weeks. 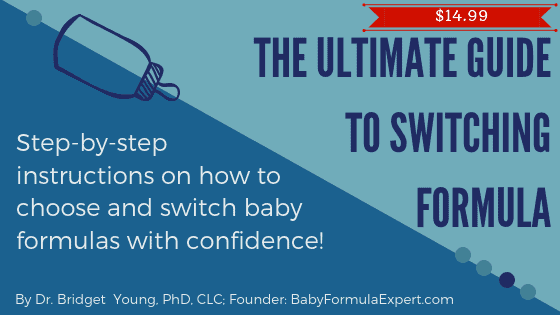 If your baby is over 3 months old, work your way up to the full dose over the course of 1 week. Once you are up to the full dose on this second supplement, stay here. This will provide baby with a very nice blend of healthy bacteria. Consistency is key and providing these supplements every day will provide great support for digestion and is more likely to result in stable changes in the microbiome. The Gerber drops are expensive. So once you are on the larger blend, you can wean off the Gerber and just stay with the Renew Life or Udo’s Choice (or whatever blend you introduced second). In this case, I suggest starting with the NutriKey Bifido powder. It only has 1 strain of bacteria to not overwhelm your little one! And this is the most common type found in the intestines of breastfed babies. Once you are up to the full dose on this second supplement, stay here. You can even wean off the Bifido powder if you want, for simplicity. This will provide baby with a very nice blend of healthy bacteria. Consistency is key and providing these supplements every day will provide great support for digestion and is more likely to result in stable changes in the microbiome. In this case, go ahead and bring in the big guns… start off with the RenewLife– FloraBaby, or Udo’s Choice, or Klaire Labs. Once you are up to the full dose, stay here. This will provide baby with a very nice blend of healthy bacteria. Consistency is key and providing the supplement every day will provide great support for digestion and is more likely to result in stable changes in the microbiome. Of course you can feel free to use a different supplement than the one’s I have discussed and introduce them however you want. The principles remain the same: Choose a strain(s) appropriate for a baby. Ramp up to the full dose slowly. Monitor your little one for signs of intestinal distress. Spread the dose out over the whole day if possbile. Be consistent. Now that you understand the biology of the microbiome, you can make your own informed decisions for your little one! Once your little tyke is eating solid foods, you can provide probiotic food sources to help grow the microbiome as well. Yogurt with live cultures and fermented foods are great sources of probiotic bacteria once baby is old enough to enjoy them. I spent a lot of time above telling you how to add a probiotic. If you are determined to also add a prebiotic (perhaps you’ve found a great baby formula that doesn’t have a prebiotic but hits all the major items on the checklist), please read this article. Determining dosing can be tricky as most supplements are marketed for adults. This article will give you all the info you need to start supplementing appropriately. I wish you and your whole house very happy digestion!! p.s. Have you found a different probiotic supplement that you love for your baby? Please let me know about it in the comments! I’m always looking for new recommendations. Thank you for this wealth of information! I haven’t found anything so informative on probiotics backed with research yet for formula fed babies. Question- when you do notice a bad reaction, what is the best course of action? Skip a day to give baby a break and dial back the dose the next day? I started with just the “digestive issues” baby (over 3m), and she didn’t do well, so I went back to the gerber drops and plan to slowly get up to 5 drops over the course of a week. Then maintain until back to the biofido. She didn’t do well on the biofido the first time though, so I am a little nervous about doing that again. She is 5 months old, on Alimentum RTF. Her negative rxns are more spit up, lots of gas, not sleeping well. Hi Mama! – thanks for the kind words! Honestly, we do NOT fully understand probiotics, the microbiome and formula enough to know what is the “best” thing to do. Also, if your angel is on Alimentum, she must have had some pretty serious intestinal issues at some point, so I would treat her conservatively. Of course ask your doc. I can only give you my opinion. If she didn’t do well with the bifido and is handling the Gerber Soothe drops OK, then I would just stick with those. It’s a great strain. Slowly get her up to the 5 drops per day and stay on that. I wouldn’t mess with the bifido again. Just my opinion. Good luck Mama! Walmart has a generic (Parent’s Choice) version for half the price of Gerber Soothe probiotic drops. Do you think there’s any reason to not go with the generic version? Baby and I need help. My baby at 2 days old was told he had a temp and needed to go to ER. He had spinal tap, chest xray, and tons of antibiotics. He was fine, they believe it was a minor common virus ( they didn’t see any growth in the blood tests for infection etc ) . In my heart I believe he was overheated and this not necessary. So now because of antibiotics, i believe we are dealing with silent reflux . I’m taking a probiotic but please tell me what u recommend. All he wants to do is eat to alleviate the pain and taste in mouth. Hi Dr. Young, My 8 week baby is eating half breast milk, half Gerber Good Start Soothe. I would like to also give her Culturelle Grow & Thrive, and I was wondering if that’s okay to give in addition to the probiotic already in the formula? She takes an antibiotic daily because of kidney issues and she has painful acid reflux, we are about to switch from Zantac to Prilosec. Her doctors said taking probiotics is fine and they haven’t recommended a particular brand. Thank you! Hi Olivia – the best thing is to make sure your Dr is OK with it (great job!). It’s absolutely OK to give an additional probiotic, especially since the dosages that come in the formula are pretty low. I will say that certain reflux meds will make the stomach less acidic which can make probiotics more potent. So just add the Culturelle slowly and work your way up to the full dosage. This way you have a better chance of avoiding side effects (which are mostly gas). Great question! Oh dear! You really need to ask your doctor after an illness like that. A single strain might be the most gentle way to start out though…. But there IS a probiotic in HiPP HA, so he/she is already getting something! Hi Dr Young, do you have another blog post about the different types of bacteria? I’m most interested in learning about B. infantis. I read somewhere that this one is the most important, and that babies born by cesarean are often missing it. Is this true? My little girl was born by cesarean; she’s not colicky but has loose stools and some bad gas every now and then. She’s mostly breastfed and I supplement with Gerber Good Start Gentle because of low supply. Gut issues tend to run in my family and I’d love to help prevent this for her. Also, once a baby is on a probiotic how long do you keep them on it? Should the body eventually take over on its own once the good bacterias are introduced? Thanks for the help! Hi Emily! Yes, babies that are born by C-section have a different bacterial profile since they missed exposure to Mom’s vaginal bacteria (no guilt Mama! Your angel will be perfectly fine!). I don’t universally recommend probiotics for infants – and she is getting amazing probiotics, and prebiotics, from your breast milk. Bad gas and occasional loose stools are super common so it’s hard to know if a probiotic is something that would help. On one hand, probiotics are safe. On the other hand, I usually recommend not messing with a good thing, especially when baby is getting breast milk. Ask your doc. If you do give a probiotic, and it goes well, I usually recommend keeping it up until the first year. Then you wean off the probiotic as you wean off formula/breast milk. Ideally your toddler would be getting lots of natural pre and probiotics from healthy food sources at that point. My 4 week old is not constipated but strains to the point of crying most times. I am able to give him some breast milk but I supplement with the Holle Goat Milk formula. I take a probiotic myself and want to get him on one too. I bought the Klaire Labs one before I read your post. Would you suggest a single-strain one instead since he’s so young and then work up to the Klaire Labs? Thanks in advance for your reply. Hi Jen, if you already have the Klaire Lab at home, then I think it’s fine to use. Just use much less than they instruct. I would work your way up to half a dose. I think that is more appropriate for such a young baby. Of course – also check that your pediatrician is OK with it! Congrats on your new angel! My 5 1/2 month old is EBF and I’ve actually been giving her probiotics (specifically Mommy’s Bliss) for about 2 months now. I’ve been noticing that she continues to be very gassy at night and hear her pushing and straining to pass gas. We’ve been trying everything from gripe water, gas drops, massages, you name it, we’ve done it. I even went dairy free and soy free from the time she was 2 weeks to 3 months and no difference. Is this something she’ll just grow out of? Should I stop probiotics? During the day she’s not overly gassy…the middle of the night is still the problem. Any insight would be greatly appreciated. Thank you! Hi Rebecca – this is a super common problem. Yes she will outgrow it! Learning to release gas is a hard thing (you’ve got to relax a bunch of muscles in a coordinated fashion). She will figure it out! Gas at night is super common as well since she is laying more still, so gas can get “stuck”. You can try mixing in gas drops into her last bottle before bed. That sometimes helps. I would also try a week without the probiotic and see if it makes a difference. Some babies are very sensitive to probiotics while others don’t notice. It’s definitely worth the experiment. p.s. I also went gluten/dairy/soy free for my second – that is a labor of love!! My baby has what appears to be eczema on his legs. I’ve heard that probiotics can heal this issue. I’m currently taking Plexus ProBio 5 (2 billion CFU per capsule) (contains an enzyme blend: proteases, chitosanase, cellulase, and serrapeptase) (contains a probiotic blend: bacillus coagulans, lactobacillus acidophilus, bifidobacterium longum, lactobacillus plantarum, and saccharomyces boulardii). Could I give my baby Plexus instead of a baby probiotic? If so, what would be a good amount to give him? He is six months old. Thanks. Hi Lindsey, great question. I would not give your baby that blend. Some of those strains are too “adult”, and there is no need to give him/her digestive enzymes for foods babies are not eating. If you are looking for a probioitc that may help with eczema, try a broad spectrum baby probiotic, like any of the brands in this article that have multiple strains. Hi, what probiotic would you recommend for a baby with CMSPI or FPIES or EOE. I’m also looking for enzymes to suit children with the above conditions. Hi Tia, oh dear – as you know these are serious conditions and I can’t make a blanket recommendation. Probiotics should be picked based on each individual’s history and symptoms. I’m sorry I can’t be of more help but kiddos with these issues need to be under the guidance of personalized medical team. Good luck! What might be the negative side effect for this if not handled properly to the baby? Too much too past usually results in lots of gas. It can also cause loose stool and blow out diapers. I really don’t know what to give my baby in order for him to have good bacteria, good thing I found this blog with recommendations and instructions. 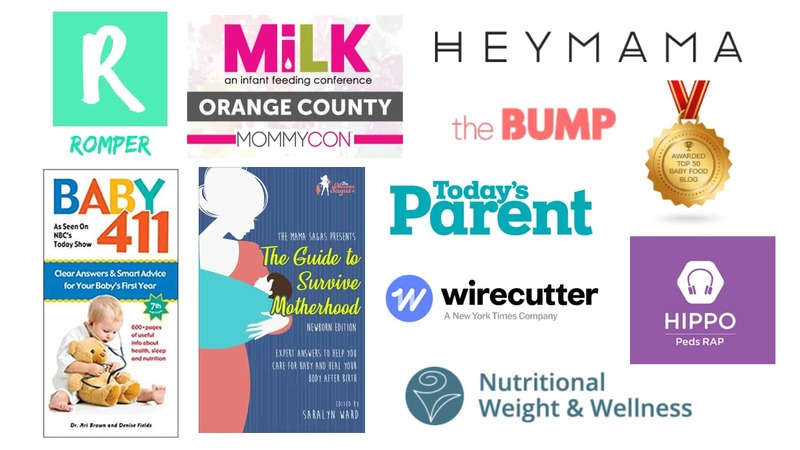 Probiotics are not something I will prioritize but this blog made me realized that breastfeeding should be supported with probiotics. By the way, I am a new mom, I guess this can actually help me. Thanks Stephanie! Congratulations on your baby! If you are exclusively breastfeeding and you and baby are healthy, then I don’t think you need to add a probiotic. Let your body’s magic give your baby the individualized probiotic it makes. If you end up supplementing with formula, or your baby has digestive issues, then it’s a good idea to ask your Dr if adding a probiotic might help. Good luck Mama! Hi, My friend is using this Qiara Probiotic for a while now and I think it’s great. Nothings weird to my Godchild, infact she looks so healthy and energetic. My friend said she’s also using it so I came to a conclusion that it really works. Both are probiotic fan. Hi Dr Young. Thank you for this very helpful post! My baby is currently doing well on HIPP pre HA formula which I believe contains only the prebiotic GOS and no probiotics. I’d like to supplement with a probiotic as I’m a huge fan of the research connecting out microbiome to so many health issues. My ped gave me a sample of “bioGaia” protectus drops (any thoughts?) which contain only the L.Reuteri strain at 100 million CFU’s per 5 drop daily recommended dose. My questions are …. do you think this doseage sounds appropriate? My little one is 7 weeks old with some gas pain and tears but not colic. Secondly, if I wanted to use one of the probiotics you recommended, where is the best place to order them to ensure temperature control (for the non- shelf stable ones?) I ordered the Gerber drops off amazon but they arrived on a hot day uninsulated and I was worried they might have lost their potency. Thank you!! Hi Hannah! I love your questions! BioGaia is a good brand and I like that probiotic for newborn cranky babies (it’s the same as in Gerber Soothe). The dosage is small, but appropriate for newborns and sensitive kiddos. If you want to try a more “broad spectrum” then just start slowly and watch how your baby responds as you ramp up the dose. Excess gas, loose stool, or blowout diapers are a sign you did too much too fast and you can just back down. The best place to get a probiotic is at a healhtfood store where you buy it from a cooler. I know my local store and whole foods sell the Renew LIfe and Udo’s Choice Infant probiotic (in a refrigerator) which are great options for a broad specturm probiotic. Most of these probiotics are pretty stable when shipped (think, they thrive in the intestine which is 98 degrees, so little heat won’t bother them). Poor storage will decrease potency but shouldn’t kill everything, so if you have to order online, keep that in mind. Some companies will ship on ice, so go to their webiste and see if they have a purchasing option. If not, call your local healthfood/hippie stores and ask which brands they cary. Lastly, you can always resort to Amazon and know that the activity may be a bit reduced but won’t be totally dead. I hope that helps! Good to know that there are ways adding probiotics to baby’s dietary meal. We all know that probiotics gives so much benefits when it comes to a health of an individual. You can also try the powdered probiotic of qiara. Youi can check it. Visit http://www.qiara.com.au/. Would you recommend probiotics for healthy formula fed babies with no digestive issues? We had C-section, antibiotics for Strep B, and a nasty case of thrush that ended our breastfeeding prematurely at 5 weeks. With all that in mind, I’m thinking baby’s guts might benefit from a probiotic but my ped will only recommend Gerber soothe (doesn’t even have colic)! Thanks! Hi Kylie! I’ll hedge that question since your pediatrician’s opinion is the most important. If your doc is only comfortable with Gerber Soothe, then stick with that! It’s a great strain. Also do you have any opinion on dry versus liquid? Hey Jenna, I wasn’t familiar with this brand. I can tell you that the strains in the probioitc component look good – but it is 6 strains and 5 billion cells. I consider this on the high end for a baby. I would not recommend this for a colicky newborn – to many strains and too many bugs. But for an older, less fragile baby it may be fine. It also has a PREbiotic in it (FOS). THis is also fine, but may be overkill if you are also using a formula that has a PREbiotic. Lastly, I have not read up on any research providing bovine colostrum to human babies – so I can’t really comment on that at all. I will look into it! Lastly, this looks like a powder, so I’m not sure I understand your question about dry vs liquid? Sorry I can’t be more helpful. If I’m mixing a whole days worth of formula at once, can I safely add my probiotics to the batch and then divide into bottles as needed? Thank you! OH YES!! This is my absolutely preferred way to do it! Add the day’s worth into your morning batch of formula. This way the dose is spread out over the course of the day. this way, the probiotic is provided just like it is in breast milk. Fabulous question. I was wondering what you think about Mommy’s Bliss Probiotics? And would the probiotic in Gerber help with constipation? Hi Gill. The probiotic in Mommy’s Bliss is single strain: Lactobacillus Rhamnosus GG. This is the same probiotic in Enfamil’s Nutramigen. It’s a nice safe strain at a good dosage. I don’t know if it would help with constipation. Every baby reacts differently to probiotics. Some are very reactive and “sensitive responders” whereas others need a pretty large dose before you’ll notice anything. Usually I like a probiotic with several strains in it to help with constipation. BUT that depends on the age of your baby and how sensitive they are. Some infant probiotics with several strains and larger doses are just too much for particularly sensitive babies! Also, if you are providing breast milk, then your baby will need less probiotics since they are getting some from your milk. 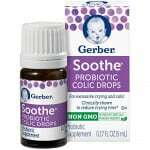 Finally, Gerber has a different probiotic in Soothe vs Gentle. Both are very safe, but provide relatively low concentrations so I am not sure how helpful they would be for constipation. In short – it all depends (sorry to be vague!). Just remember to add any probiotic slowly and track reactions to be sure you don’t cause a gas problem from an explosion of bacteria 🙂 If you want to give me some more details about your baby, set up a time for us to chat! Hi, Dr. Young! A request and a question: The buttons/links to the downloadable dosing worksheets appear to be broken. Any way you could please share the worksheet for the “If your baby is not colicky but experiences digestive issues frequently” category? Also, in your guidance around dosage, you write, “Once you have made it to the full dose and haven’t experienced any negative side effects, stay at this dosage…” Would you please elaborate about the egative side effects?” What might the negative side effects be? Thank you!! Thanks so much for telling me! The links should now be fixed. I will email you the protocol just to be safe. The most common reactions are those associated with the lower intestine (where most of the bacteria live) – usually gas and/or loose stool. Would you give your opinion on Culturelle’s Kid formula packets? My daughters pediatrician recommended them for her 4 month old. Hi Deborah, This is a great probiotic. It is a single strain – but one that is well studied in babies. The dosage is pretty high to jump into for a baby (5 billion CFU), so I would definitely work up to that much slowly. My baby seems to have acid reflux and doesn’t have dirty diapers very often, about every 3 days or so. He seems fussy and sometimes in pain due to acid reflux and possible some constipation. I would like to start using the Gerber colic drops but he is already on similac for supplementation which I think has probiotics or either prebiotics already. I am no longer breastfeeding so he is now exclusively formula fed. I called similac to see if I could Corinne to use supplementation even though I am not longer supplementing and they told me it has the exact same nutrition as similac advance except 10 more pre or probiotics (can’t remember which one). Since his formula already has that in there is it ok to still start him on the gerber colic drops? I may switch him to similac for spit up but will wait and talk to my doctor on Monday about the switch. Is it ok on both formulas in case I switch? He spits up all the time and has some other issues that I think is acid reflux. My baby’s pediatrician is very conservative so I don’t think he will prescribe Zantac or anything like that. My baby just turned 8 weeks old yesterday. Hi Heather, I am so sorry you are dealing with reflux (my nemesis!). Definitely talk to your doctor – reflux is so tricky! But for your knowledge, Similac Advance and For Supplementation BOTH have the same PREbiotic. I think it is fine to add a PRObiotic, and I like the Gerber Soothe drops. I find this is especially helpful to have a PRObiotic in place before switching formulas since you can keep the same probiotic going during the switch, which provides some consistency to the intestines. Please check out my (free) Probiotic Supplementation Protocol which gives suggested dosages and instructions. Run it by your doctor. i want to make sure i am getting this correct. when it says work you way up to the full dosage that means i start out with the 3 1/4 teaspoons a day or do i work my way up to that over the course of the week? and then i use that together the flora baby or do i switch to that then alternate? Hi Melissa, I hope I am reading your question correctly. I highly recommend downloading the protocol since I have exact “dosages” for each day, depending on your baby’s age and temperament. But in general, you work your way up to the full dosage over the course of 1 or two weeks. When you are at the full dosage, you ideally spread the full dosage out over the course of the day. So, if the full dosage is 3/4 teaspoon, then it’s best to provide 1/4 teaspoon in a bottle – for 3 bottles over the course of the day (adding up to the full 3/4 teaspoon). Only introduce one probiotic at a time. If you want to switch to flora baby, I would keep using whatever you are using now while you slowly work your way up to the flora baby dose. Then, slowly wean off the first probiotic, gradually reducing how much you are giving every day for about a week, until you stop altogether. I hope that answered your questions! 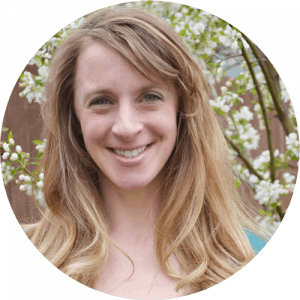 Hi Dr. Young- i started my 5 month old out on klaire labs infant probiotics, she was born via cesarean and her stools were frequently runny, she also had a bit of blood in her stool at 2 months but it cleared up. After 3 days of probiotics, 1/8 tsp, she was miserable, frothy green stools, mucus, blood, diarreha. I took her to ped and they said mspi, but Im really worried that the probiotics harmed her gut . That was almost 3 months ago and things still arent right, still mucus and occasional spots of blood. Could the priobiotics have caused her gut to get permenantly out of balance, I feel terrible. Thank you. Hi Nina, I am so sorry to hear your little one has had a rough go! That can be so frustrating. You are obviously doing a great job. Please stop beating yourself up. ALL the research shows that probiotics need to be used consistently for several weeks to show any change in the microbiome. Thus, I there’s really no way that 3 days could cause permanent damage. If she does have a milk/soy intolerance, her gut lining was likely inflamed (which is what probably caused the blood you saw at 2 months). When that happens, probiotics can cause a flare-up. But don’t worry – this will not cause permanent damage. It’s similar to salt on a wound – it may make the wound sting more for a second, but doesn’t cause permanent harm. I am really proud of you for continuing to breastfeed through all this! I know that must be really hard! Did you give up dairy and soy? This will likely help her. If it doesn’t, other big culprits that often cause infants to react are: chocolate, caffeine (I know!) and eggs. I do think a probiotic will eventually help her gut flora balance out, but its important not to introduce it until her intestines are in a healthy place, and you haven’t seen blood in her stool in a long time. The good news is, her intestines are very actively maturing right now, so even if you don’t figure out exactly what’s bothering her, she’s likely to outgrow it shortly.